What Apps Is Your Child Using? Just because your child does not have a Facebook or Twitter account does not mean they are not using social media resources. I have been hearing rumblings from various communities (including Burlington) about elementary and middle school-aged children making poor choices with social media resources. I am certain that in many cases that the parents of these kids are unaware that their kids are over-sharing personal information, posting and viewing inappropriate pictures, and having inappropriate conversations with friends AND STRANGERS. The bottom line here is that parents need to check on every app at that their children are adding to their iPod, iPad, iPhone, or other web-enabled device. We have moved so quickly from the days when our biggest web-based concern regarding our children was a desktop computer in a common area of our homes. As we are well aware, many of the gadgets that they carry in their pockets can do so much more than those desktops could ever do. With new social media apps and websites coming onto the scene at a breathtaking pace, it is not surprising that parents can’t keep up. 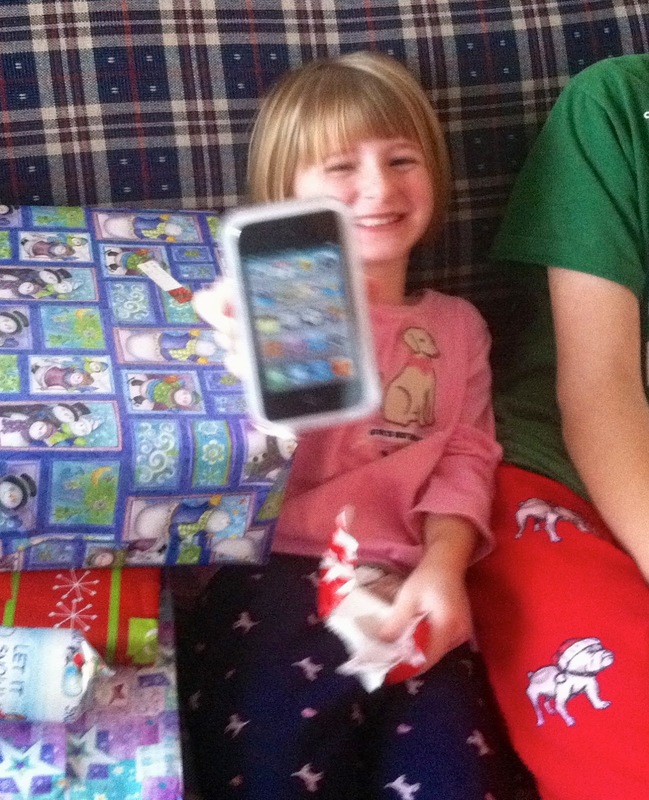 Do you know what apps are on your child’s iPad, iPod, Smartphone, etc.? Do you know which apps are connected to social media resources? Do you monitor the social media accounts that you have allowed your child to create? If you answered no to at least one of the above questions then you are probably in the majority of parents out there. If you answered yes to most of the above questions then please share your knowledge with the parents you know to help them stay on top of what is happening. The fact of the matter is that these sites typically require a user to be at least 13 years of age to register and many kids lie about their age in order to sign up which raises an additional issue. In regards to Snapchat, you get bonus points if you know that one. Snapachat has become known by many as a tool for sexting as a recent Mashable post describes. The way it works is that an individual may send another individual a picture and the sender decides how long the person receiving the picture can view it (from 1-10 seconds) and then the picture disappears “forever.” Of course since lesson number-one in the whole social media game is that anything you say online can follow you “forever,” we know this is not true. From a parent’s perspective, it is tough to connect the current experience that our children are having with social media resources to our own experiences growing up. All we really had was a telephone to connect with our friends and have social conversations. In addition, most of us had some time limits in place when it came to these conversations. In my opinion, it would make sense for us all to at least have some idea of how much time are kids are spending online and what they are up to. Common Sense Media has some great resources for parents to help them set appropriate ground rules for their kids. 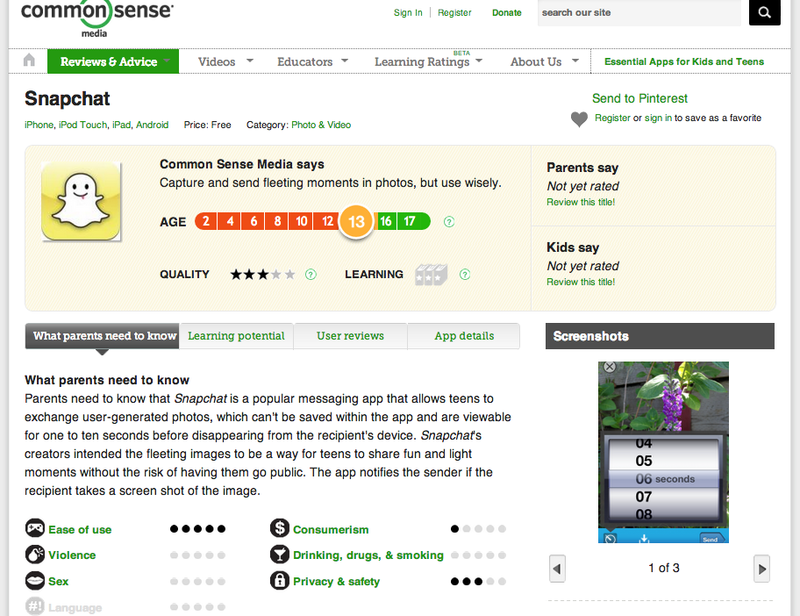 It also provides parents with great app reviews, like the one below for Snapchat. You can search with the box in the upper right hand corner for a review of most apps and find out some useful information before deciding whether or not it is appropriate for your child. If you feel you are a parent who has a good handle on this issue, then please share some of the practices that you think are working well! If you are parent who feels lost and needs immediate assistance, please contact me and I would be happy to offer some advice/assistance (larkin@bpsk12.org).